Be wary of the Scorpion's sting. The Scorpio man is not a man to be trifled with. He is serious and sometimes stern, with little time for the non-essential and unimportant. He seems to see the world only in black and white. Shades of grey are too ambiguous and do not interest him. He is incredibly curious, and wants to learn about everyone and everything, but he usually likes to figure these things out on his own. His keen sense of intuition helps him unearth the plain truth of things, and he is a master at asking questions that are both direct and penetrating. He rarely takes others' answers at face value, however, and comes to his own conclusions. A Scorpio man always has a firm hold over his own destiny. He has control over any situation he finds himself in, and lives life on his own terms. There is deadly kind of beauty to the Scorpio man – he is independent, fearless, and ambitious. Don't get in his way and don't place any bets against him. A self-made winner, the Scorpio man rarely knows the pain of defeat. His stubbornness and resourcefulness will drive him to keep trying, determined to get what he wants. He is also hard working and enjoys the satisfaction of basking in the fruits of his labor. The Scorpio man doesn't live under a rock like his animal sign does, but he is secretive and very complex at times, not likely to spill out his darkest secrets at the first sign of friendliness. In fact, friendships with a Scorpio man have to be proven and won with loyalty before he will get chummy. Attempts at trying to get too close too fast may result in him retreating to his lair in high suspicion and a little bit of alarm. You can't tame a Scorpio man. He's not a pet to be coddled or pampered but a natural force to be reckoned with. Ruled by Mars the god of war and Pluto the god of the underworld, Scorpio men are intense, passionate, and filled with desire. They can be moody and vengeful, with a hot temper and long memories for any wrongs, imagined or otherwise, done against them. Intimidated yet? Well, once you get to know a Scorpio man, you will be happy you took the time. He is a delight in his own way - a man who cuts through appearances and gets to your very soul. He is more vulnerable than he lets on, and he is wiser than probably any other man you know. All Scorpios have a long-term strategy and approach to life, so if you lose a battle with a Scorpio man today, it doesn't mean he's given up. He's probably just biding his time and waiting for an opportunity tomorrow. This sign is nothing if not resolute. Steamy Scorpios include Joaquin Phoenix, Matthew McConaughey, Leonardo di Caprio and Chris Noth. Although a Scorpio man may seem unemotional, that's all just for show. Underneath his calm, cool, exterior is an electric undercurrent of roiling feelings. Like all water signs, he is much attuned to his own and others' emotions and feels deeply. Not much of this is on display for the outside world, however, as Scorpios dislike losing control over their own feelings, at least not publicly. Love for a Scorpio man is both powerful and passionate, a catalyst that changes his entire life and outlook. He is a caring and devoted lover, if a little possessive. This possessiveness is just the Scorpio way of expressing his love. Behind his aloof exterior, the Scorpion is sensitive and loving but he will only let down his guard and show this side of his personality to the right partner. Scorpios are typically considered most compatible with Pisces and Cancer. The Scorpio man's charisma and magnetic charm explode into a shower of sparks in the bedroom. Impossible to resist, he is darkly and very intense. In the aftermath of love with a Scorpio the phrase "best I've ever had" is often used to describe the encounter. His intuition and passion make the Scorpio man a perfect lover. An enigma between the sheets as well as out of them, this sense of mystery is often what draws so many lovers to a Scorpion's den. They are not usually disappointed by what they find there. If you're looking for safety, security, and missionary, then this Scorpion is not for you. Adventurous and lusty, the Scorpio man will try anything once, even if it's just to say he's been there, done that and doesn't think too much of it. He is generally considered most compatible with Pisces, Cancer, Capricorn, and Virgo. See also Sun sign compatibility. However, there is a lot more to compatibility than only the comparison of the Sun signs. For example, how do your Venus signs compare? Find out Venus signs here. Discover Venus sign compatibility here. Multi-faceted and complex, the Scorpio man is an emotionally charged individual who can be as intimidating as he is passionate. Intensely loyal to friends and family, his unlimited fervor makes for a wildly exciting partner. Like his Zodiac sign, the Scorpion, he can be an ominous force to be reckoned with when angered. As volatile as the Scorpio man's reputation, there's a surprisingly calm and collected side to his personality, and in fact, this is the side that is most commonly in place. When you combine this with an extremely analytical mind and a curious nature, you have a man whose exhilarating complexity is like nothing you've ever experienced before. The Scorpio man has a need to be in control, so he manages money very well - usually. True to the intricate nature of this man, a compulsive behavior may sometimes take over and cause him to fork over money on an extravagance that's not really needed, but looks good in the driveway. On the positive side, the Scorpio man can control his spending and will easily switch from needless expenditures to sitting with his banker and discussing appropriate financial investments for the future. Since Scorpio is considered the hotiest sign of the Zodiac, what color could be more appropriate for this man than red? You won't see him all dressed in crimson unless he's presenting himself as Santa Claus, but his pin-striped suit could be accessorized with a red silk tie. And the color of that car he drives? Expect the Scorpio man to be dressed in the latest styles with clothing selected to accent his strong physique and natural good looks. His jewelry will be well designed – distinctive, but not garish. From jeans to tuxedos, the Scorpio gentleman knows how to dress. The Scorpio man enjoys his family and large circle of friends. Although he's generous and caring, those who have done him wrong may see an equally vindictive and nasty side to the Scorpio man's personality. However, many Scorpios have learned that the best revenge is living well, and will gladly freeze out any wrong-doer and simply live the best he can. Scorpios can be extremely wise. It's true that they might hold on to anger longer than most signs, but as they mature, they learn better ways to manage their emotions. Although a Scorpio man enjoys looking into the lives of everyone around him, he maintains an air of secrecy about his own affairs. This hot mystique adds one more dimension to an already complicated character profile. Scorpio men are unafraid, or at least far less afraid than many men, of intensity in a woman or in a relationship. He won't avoid a tricky area, preferring to argue if need be than to gloss over deeper issues. This is a highly attractive trait to many people. As well, it should be noted that Scorpio men dislike being ignored or frozen out. The cold shoulder approach is not a good idea with a Scorpio partner. Scorpio men are looking for someone "real". They are not impressed with superficiality and prefer that partners are true to themselves. Curious to a fault, the Scorpio man's insatiable need to know continues right into the bedroom. Spontaneous and always eager to try something new, the Scorpio man's voracious appetite for intimacy requires a partner equally as adventurous and passionate to keep pace with him. Little known fact about Scorpios: many are extremely understanding of their partners' needs and desires and will adjust accordingly. A jealousy that borders on possessiveness can be the downside to this man's emotional intensity and he demands the full attention of his partner. Scorpios who have learned that possessiveness gets them nowhere, however, will allow a partner breathing room. 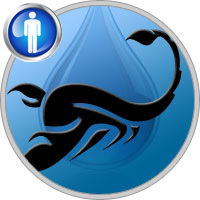 People with highly emotional temperaments may also be affected by stress-related health issues and the Scorpio man is no exception. He would be wise to routinely take a break from his overly active lifestyle and catch up on his rest. A little relax time is good for the Scorpio man – and probably appreciated by his partner. If his companion thinks the rest time will last, then it's a wrong assumption. The free-spirited Scorpio man has an ability to quickly rejuvenate and normal ailments don't usually keep him off his feet for long. The Scorpio man will be a success in whatever career path he chooses to follow. Tirelessly hard working, this man has a powerful work ethic which makes him an in-demand employee who's liked and respected by his supervisors and fellow workers alike. When you consider his natural perceptiveness, a Scorpio man would do well in the areas of journalism, psychology, psychiatry, scientific research, and criminology.